Customers using the Schoology learning management system can embed content from Films On Demand directly into their courses. For more information, please refer to the Films On Demand Schoology LTI App Overview article. The new app provides rich integration between Films On Demand and your Schoology courses. Users of Schoology will now be able to embed Films On Demand resources directly inside their courses, without having to leave the LMS. You must have your own instance of Schoology. You must have an active Films On Demand subscription. Your LTI Access Key and Secret - can be obtained from support if it was not provided in the welcome email when your account was first established. 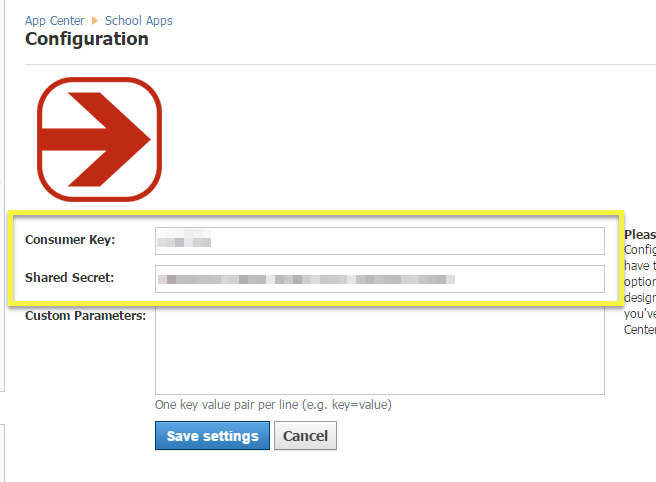 Login to your Schoology instance as an administrator with access to install and configure apps. Locate the Films On Demand app and click on it to view the details. Next, you will be asked if this should be installed for your entire organization, or just you. Assuming you would like all of your professors to have access to the app, select Add to Organization. Assuming you selected Add to Organization, you will be redirected to your Organization Apps section to complete the configuration. Before anyone can take advantage of the Films On Demand app, you must configure it by inserting your provided Key and Secret. Enter both values in appropriate fields shown below and click the Save Settings button. No custom parameters are used. Configuring the App is not the same as installing it. School Admins have the option to configure the App only, giving their instructors the option to install it individually. To do this, do not check any boxes designating which course or school you want the app installed in after you've clicked the Install App button located in Schoology's App Center. If you successfully installed and configured the Films On Demand app, you should be able to access it and perform a search. Please consult the Films On Demand Schoology App Overview article for more information. If instead, you receive an error message stating that your request cannot be validated, please contact our support department.